Our Pear and Roasted Almond Cream Cheese Tart is truly a special dessert. It whispers Autumn in warm and toasted tones and tastes. The perfect dessert to end an intimate dinner party. A simple Tart that can be assembled and baked in less than an hour. We’ve dressed it in Candied Glass Pears, drizzled it in a Fresh Pear Coulis and finished it off with a dollop of Vanilla Bean Whipped Cream. A few easy steps that yield a dessert beyond compare. The hint of sea salt from our Pan Roasted Almonds cuts the sweetness of this tart perfectly. Do make sure that you wrap your springform pan in heavy-duty foil, as per the instructions! The butter can find its way out of the bottom of the pan and will scorch on the bottom of the oven. The foil keeps it contained and your oven clean and your house smoke-free!! While this isn’t a cheesecake it does have some cheesecake like qualities. Always Chill after Cooling: Once your tart has cooled off, be sure to allow it to chill overnight. This practice ensures that the tart has the proper texture and is set properly. Cutting this tart before chilling will give you a custard-like quality, which is not what we are looking for when serving. Chilling produces a rich, smooth, mouth-watering texture just like with a cheesecake. Prior to cutting: hold a long non-serrated knife under hot tap water for a minute. Wipe the knife off on a clean kitchen towel before making every cut. Freshly baked tart will keep in the fridge for about 1 week, securely covered with plastic wrap. Tarts also freeze extremely well! Once your tart is set and firm, set in the freezer for about an hour. Then remove and wrap tightly with plastic wrap and then a layer of heavy duty aluminum foil. properly stored it will preserve its highest quality for 2 months. Our Pear and Roasted Almond Cream Cheese Tart is truly a special dessert. It whispers Autumn in warm and toasted tones and tastes. It's the perfect dessert to end an intimate dinner party. Preheat the oven to 425°F/218°C. Wrap a 9-inch Springform Pan in heavy-duty aluminum foil and line with parchment paper. Set Aside. Beat the butter and sugar until fluffy and add the flour. Spread into the bottom and halfway up the sides of the parchment lined 9-inch Springform Pan, you can use the back of a metal spoon to smooth it out and spread it out uniformly. (it is a naturally sticky dough, you can also run the spoon under hot water and wipe off, then spread). Beat the cream cheese and sugar in a large bowl until well blended on medium speed. Add the eggs one at a time until blended, then add the pure vanilla extract and blend until combined. Pour over the crust and spread out evenly. Mix the sugar and Cinnamon, set aside. Slice the pears and then gently dip each slice into the cinnamon and sugar mixture coating both sides. Then arrange on the top of the filling. Sprinkle with the Roasted Almonds. Place in the preheated 425°F/218°C and bake for 10 minutes. After 10 minutes has passed lower the oven temperature to 350°F/176°C and bake for an additional 25 minutes or until set. remove from the oven and allow to cool on a wire rack for 3 hours. Highly suggested that you refrigerate overnight after cooling completely. Run a thin rubber spatula around the outside of the tart to loosen the sides from the pan. release the springform pan. Slice, garnish and serve. Cut a Vanilla bean in half and then cut in half lengthwise, use the back side of the knife to scrape out the vanilla bean seeds. Add them to 1 cup of chilled heavy whipping cream along with the scraped out vanilla bean and allow to soak while your tart cools. Remove the vanilla bean and add the heavy whipping cream, to a well-chilled bowl and beat until soft peaks begin to form. Add 1 Tablespoon of powdered sugar and beat on high speed just until stiff peaks form. If you overbeat your whipped cream and have a butter-like consistency, don’ worry just add an extra tablespoon or two of whipping cream and beat on low until desired texture is reached. 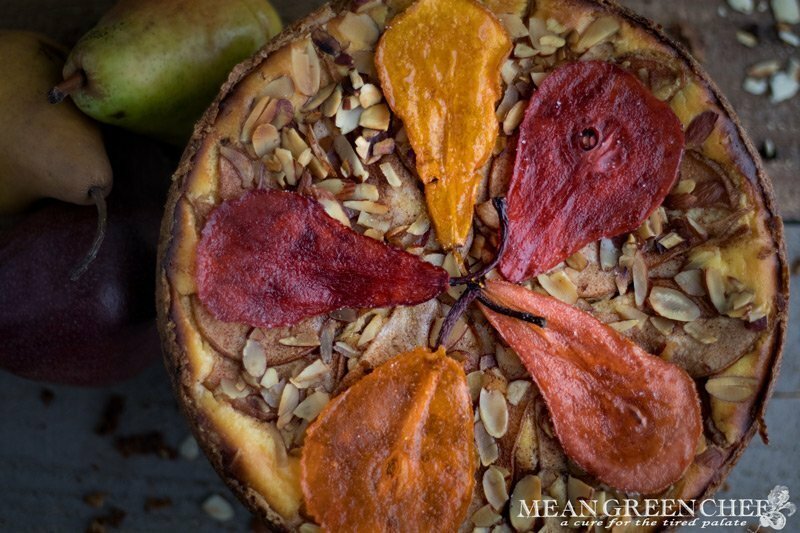 You can find our Colored Glass Pears recipe and cooking technique here, and our Easy Pear Coulis for drizzling this most perfect dessert tart. wow! This looks amazing!!!! Too bad I can’t cook worth a darn! However…I may print this out for my husband…. Oooooooooohhhh!!!! Looks Delicious! Thanks for the recipe. I can’t wait to try it! You certainly know your stuff. I love how unique everything you make is! This site is a gem! Your tart looks yummy! I particularly appreciated the tips on how to properly cut and store it as I have actually never made a tart before (baking isn’t something I do all that often as I have a diabetic husband). Oh wow. This looks amazing! I love pears. I must try this for my boys. We have a pear tree that’s dropping tons of pears. Maybe I should do this for neighbor gifts as well. Wow, you are so talented. This sounds so good and I like how detailed your instructions are. Looks delicious! I love cheesecake, so I’m guessing I’d like this cream cheese tart as well. Uh, this sounds yummy! I’m pinning this recipe to remember and give it a try! You always make such pretty food! This looks delicious! It looks too beautiful to eat! But it sounds super yummy, too! It looks delicious! Perfect for this time of the year! This is beautiful! Can’t wait to try it! Thank you, Lauri! The candied pears are fun to make too! Your pictures always look gorgeous. I finally got a springform pan so I just might have to try this recipe. This looks so delicious! I love pears and I think they would be lovely in a cream cheese tart. I’ve never seen a recipe like this! It looks delicious! Those almonds really kick the recipe up a notch. I love tarts! But I must say I’ve never seen this one before. This looks like a must try! I love pears! I bet this recipe will be delicious! Your pictures are amazing. Its like I could reach out and touch it. Great post and recipe. This looks like such a delicious treat! Pears, almonds….yum! While not something we could make in our home due to food allergies, I would devour a piece of this if out at a restaurant or visiting a friend who made it. The pictures are so tempting.